Address: 161100 Vologodskaya obl., Kirillov, Siverskaya St., 9"a"
National Park Russky Sever is situated in the Kirillovsky District of Vologodskaya Region. The Park was founded in 1992; its area is 166,4 thousand ha. The Park is located within the Belozersko-Kirillovskaya mountain ridge between lakes Beloye, Vozhe, and Kubenskoye. Natural conditions are very diverse due to the complex landscape of the territory. Lakes are numerous in ancient river-glacier valleys and the lowlands between hills. 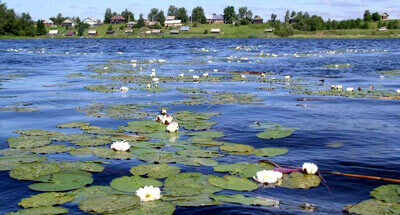 Many lakes are connected by canals, which were used when the Severo-Dvinsky water route was being built. 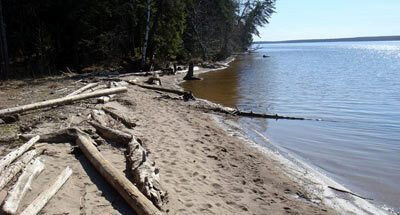 Lake Poreshnoye is the most interesting (area 1235 ha), being a model example of non-disturbed middle-taiga lake. 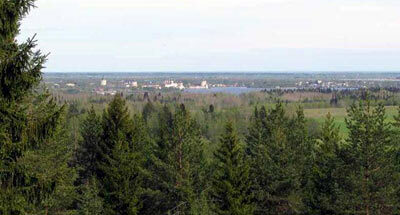 Height changes are up to 100 m.
The border between middle and southern taiga forests goes along the edge of the Park’s territory; spruce, pine, birch-spruce and birch-aspen forests prevail. Primary coniferous forests practically do not remain; on the most part of the territory natural secondary plantations are spread. Spruce forests of different age structure, characteristic for middle taiga forests, remained within the Shalgo-Bodunovsky forest (an ex-landscape zakaznik). Along the rivers and streams, on the lake-side terraces grass-gramineous meadows are spread, having appeared in place of the forests. The great diversity of flora encompasses a combination of taiga, arctic, Siberian and European species. The northern border of oak, hazel, maple, lime areas lies in the Park. More than 500 vascular plant species are noted, including rare ones (yellow lady's slipper, Epipogium aphyllum, Dactylorhiza baltica, lake quillwort, etc). 228 vertebrate animals are registered, including 48 mammal species and 161 bird species. On the Park’s territory there are historical-cultural monuments of world significance: the Kirillo-Belozerski, Feropontov and Goritsky monasteries, and the Nilo-Sorskaya hermitage. Monuments of wooden architecture, civil and country architecture, and of techniques of the past (for example the Mariinskaya and Severo-Dvinskaya sluice systems) are numerous. Traces of ancient man are the oldest archeological monuments, dating from 5000 years B.C. (Pogostische I, II, and IV; Karavaikha; the pile settlement on the river Modlona). The most complete complex of Slavonic and ancient Russian monuments is found near Nefedovo village. A characteristic agricultural landscape is also presented.